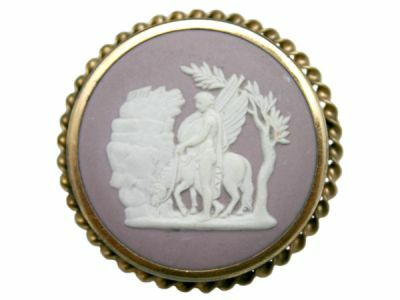 Beautiful circular lavender Jasperware tile, bezel set in an open mount gold plated brooch with twisted rope border. Stamped Wedgwood Made in England 61 TC (1961)with a locking C clasp closure, the bas-relief depicts the famous mythology of Bellerophon watering Pegasus, a design attributed to William Hackwood, c. 1773. Pegasus, the winged horse, is led by Bellerophon before attacking the three-headed monster Chimaera. Attacking Chimaera from the air put him at an advantage over other men that died trying. Brooch measures 1 5/8” across.